Engraved Traffolyte or Ivorine valve tags, labels and discs with chains. Made to order, we offer a quick turnaround with most orders being despatched within a couple of days. If you do require a fast delivery please let us know and we will endeavour to meet your requirements. The valve and pipe ID labels and tags are available with screw holes or a self-adhesive backing and come in a variety of colours. All discs are supplied complete with a 160mm fixing chain. Extra chains can be purchased to go with the labels and valve tags. 42mm diameter engraved traffolyte discs in a range of colours. All discs are made to order using a high quality engraving laminate. We offer a quick turnaround with most orders being dispatched within a couple of days. If you do require a fast delivery please let us know and we will endeavour to meet your requirements. Each disc comes complete with a 160mm long chrome plated brass fixing chain and connector. Traffolyte engraving labels, discs and tags are ideal for marking up pipework and plastic tube. Traffolyte is a very strong and hard wearing material which is particularly good for use in boiler houses and plant rooms carrying all services such as water, gas, heating, oil and reclaimed water. Our engraved labels, discs and markers are suitable for labelling up pipes for air conditioning systems and piping to electrical consumer units. 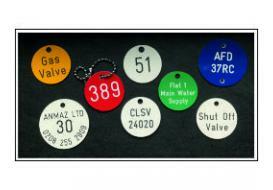 Engraved traffolyte valve and pipe ID labels and tags in a range of colours. All labels are made to order and we offer a quick turnaround with most orders being dispatched within a couple of days. If you do require a fast delivery please let us know and we will endeavour to meet your requirements. 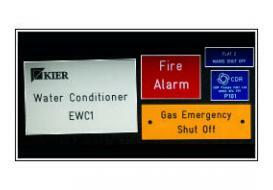 The labels and tags are available with screw holes or a self-adhesive backing. 160mm fixing chains are available to order at the end of this section. Traffolyte engraving labels, discs and tags are ideal for marking up pipework and plastic tube. Traffolyte is a very strong and hard wearing material which is particularly good for use in boiler houses and plant rooms carrying all services such as water, gas, heating, oil and reclaimed water. Our engraved labels, discs and markers are suitable for labelling up pipes for air conditioning systems and for piping to electrical consumer units.